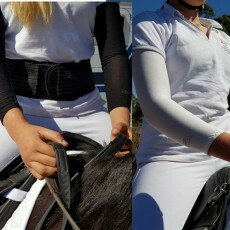 UV Sun Smart Arm Sleeves Color: White 0r Black, UV Protection over 98%. UV Protection for various outdoor activities such as riding, golf, tennis, fishing, gardening, jogging, or driving etc. Material:100% Polyester. Handwash with clear water only and dry in shade Don't soak in washing powder or bleach. Only available in (Large White )size. Length: at rest (no stretch) 45 cm, Top Width: about 14cm, Bottom Width: about 10.5cm Will fit arms 30-35cm circumference at the top. Only available in (XLarge Black )size. Length: at rest (no stretch) 47 cm, Top Width: about 14.5cm, Bottom Width: about 11.5cm Will fit arms 31-36cm circumference at the top. Be UV aware Extract from Cancer Council Australia Be extra cautious in the middle of the day when UV levels are most intense. The SunSmart UV Index tells you the time period in which you need to be SunSmart. It is on the weather page of most daily newspapers. Check your skin regularly and see a doctor if you notice any unusual skin changes. If you have a lesion that doesn’t heal or a mole that has suddenly appeared, changed in size, thickness, shape, color or has started to bleed, see your doctor immediately. Treatment is more likely to be successful if skin cancer is discovered early.